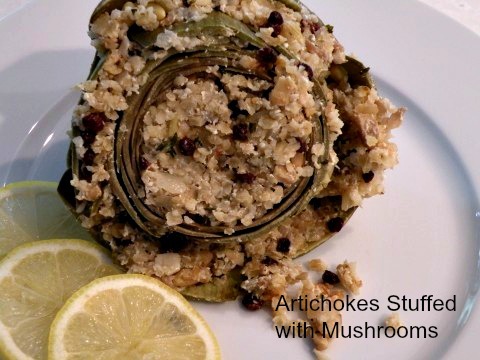 Artichokes stuffed with anything is a popular dish within the Greek cuisine. Grown in family gardens, they are very popular in restaurants across Greece. This recipe stuffed with bulgur and mushrooms is new and improved from the traditional bread crumb stuffing to a more healthful bulgur grain. Greeks love to stuff everything! We stuff tomatoes, eggplant, squash, so I decided to stuff artichokes. Artichokes are grown along our coastal region of Monterey, California producing nearly 100% of the artichokes. They are a great source of vitamin C, foliate, and potassium. For information on the artichoke festival see this site, California Artichoke Board. One last note; when buying artichokes look for a nice green color, and with leaves that are closed, not open. Visit the Cooking Technique for this recipe for more detailed pictures. 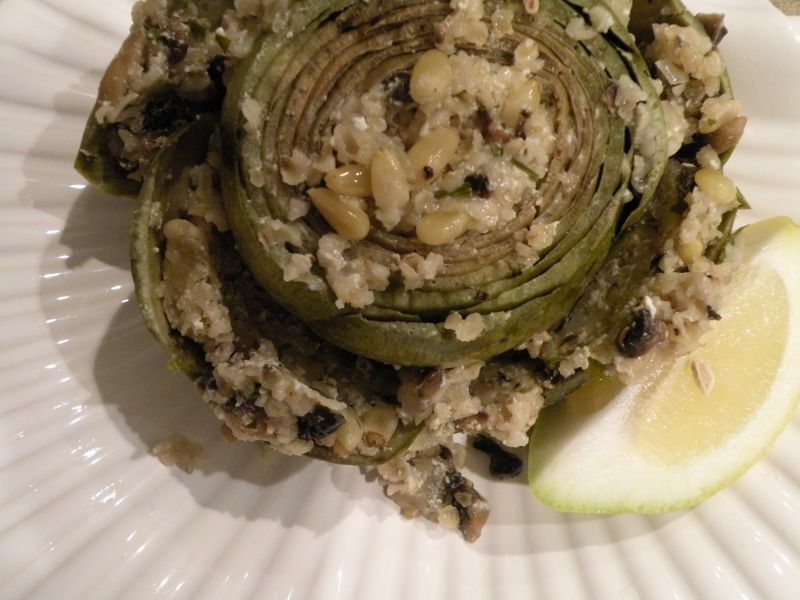 Try this satisfying bulgur-stuffed artichoke for a healthful alternative. Bring 2 cups of water to a boil. In a medium bowl add 1 cup of bulgur and add the boiling water. Add 1 teaspoon salt and cover. Let stand for 30 minutes. In the meantime, place three tablespoons of olive oil in a large skillet and saute mushrooms, onions, garlic, pine nuts, parsley, sage, thyme, zest of one lemon, lemon juice of 1 lemon, currants, salt, pepper. Remove from stove and allow to cool for 30 minutes. Clean artichokes using a serrated knife cut off ⅓ of the top of the artichoke. Take off one row of bottom outside leaves. With scissors trim the leaves in half all the way around the artichoke. Cut off the stem, all but ½ inch to allow artichoke to stand in the cooking pan. Using a corer, a spoon, or your fingers pull out center of artichoke until all thistle and yellow leaves are gone, leaving the heart in place. Place artichokes in a bowl of water with the juice of ½ lemon , to keep the artichokes from turning brown. Squeeze any excess of liquid out of the bulgur, using a paper towel or a sieve. Add bulgur, cheese and 2 tablespoons of olive oil to the stuffing mixture, so it becomes paste-like. Stuff the inside of each artichoke and divide remainder of stuffing among the four artichokes. Stuff one layer of leaves from each artichoke. Add a drizzle of olive oil on top of each artichoke. Place the artichokes in a large deep sauce pan or dutch oven and add the wine and cover. Bring to a boil and reduce heat to a simmer. Cook on the stove top at a simmer for one hour. Check occasional to see if more liquid is needed. Let cool for 10 minutes before serving. Drizzle any cooking juices on top. Serve warm. © 2010 – 2019, Mary Papoulias-Platis. All rights reserved.